Martin Kielty is a Scottish journalist with 20 years’ experience of national newspapers. 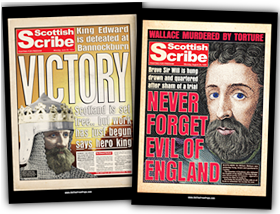 Along with senior editorial roles in which he produced for real the kind of tabloid splashes which appear in Old the Front Page, he has also written for a wide range of titles on Scottish history and culture. He has appeared on TV and radio, commentating on rock music history and culture, and runs a successful rock and metal news website. He is a freelance PR, advertising and media consultant, offering design, production and advisory services to a wide range of commercial clients. His previous books include Are Ye Dancin?, music impresario Eddie Tobin’s unofficial history of Scotland’s dance halls; Apollo Memories, the story about the legendary Glasgow venue; and SAHB Story, the official biography of the Sensational Alex Harvey Band.